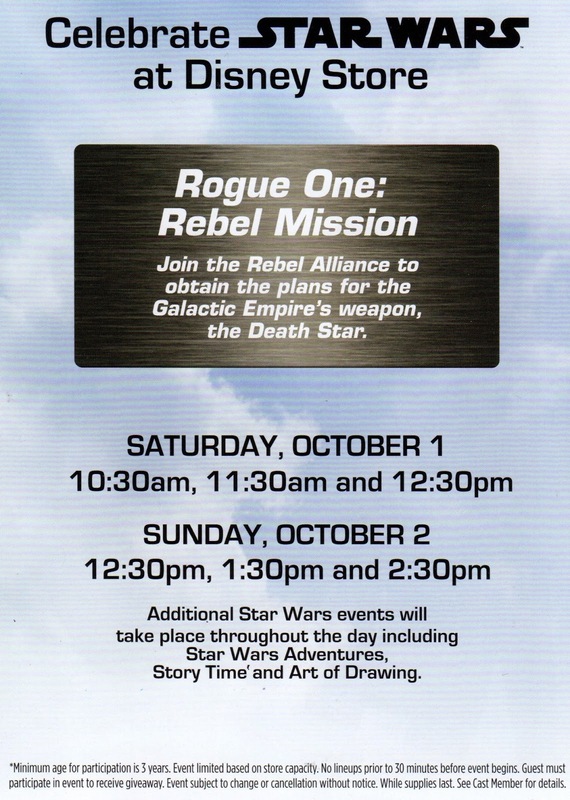 Rouge One isn't scheduled to hit theatres until December, but the Disney Store is launching it's Rough One merchandise today. To celebrate children are invited to learn more about the Star Wars story by attending a Rouge One: Rebel Mission event at selected Disney Store locations, (Montebello is participating!). Usually children who participate in a Disney Store event are given a special take-home items such as a certificate, sticker, mask, or button as a thank you for attending. Fine print reads: " Minimum age for participation is 3 years. Event limited based on store capacity. No lineups prior to 30 minutes before event begins. Guest must participate in event to receive giveaway. Event subject to change or cancellation without notice. While supplies last. See Cast Member for details."